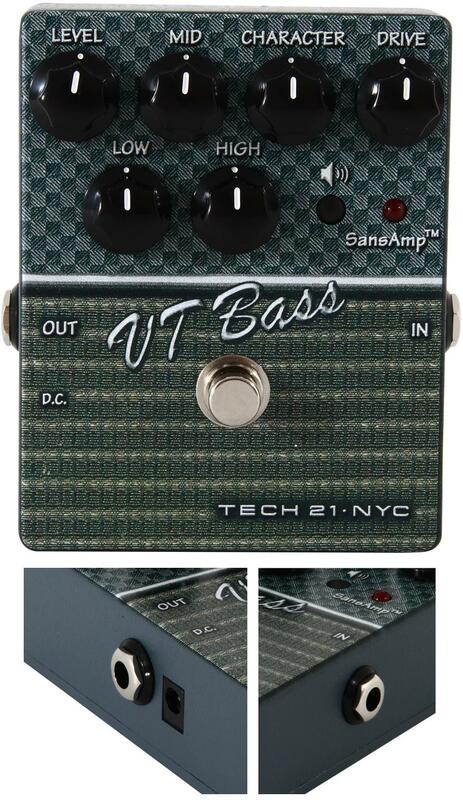 The SansAmp Character VT Bass V2 offers the same voice changing feature as the bigger VT Bass Deluxe, but in a more compact form. By turning the character knob, this pedal emulates the sound of many different bass amps, be it classic tube driven or modern clean. It doesn't have the preset switching option of its sibling, but it does share the same SansAmp analog preamp circuit, preamp controls and 3-band EQ. This means that you get the same sound quality, but without the convenience of quick preset changes, which can be a good thing if you just want a set and forget unit, or you're the type of bassist who uses a single tone for most of what you play. For direct recording, the pedal has built-in speaker emulation that replicates the response of a 10" speaker cabinet. The unit is housed in a rugged and compact stompbox pedal that's easy to use and integrate into pedalboards, and note that it doesn't have an XLR out. Dimensions: 4.625" x 3.625" x 2"
This pedal got most of its commendation from bassists who loved the way it colored their sound. And many users specifically mentioned its overdrive/distortion effect to be ideal for their tastes. Almost all users were also convinced that the build quality for the pedal is top notch. There are a few that reported a subtle noise issue, which they noticed when doing quiet recording. There were also some who noted that the controls are a bit too sensitive, in that minor tweaks to the knobs can cause big tone changes. Get the SansAmp Character VT Bass V2 if you want versatility, but prefer it in a more compact setting. This was on our recommended list until we performed a major review of this category in January 2019 when we found there were more highly rated options available which you will find in our guide to The Best Bass Preamps.